Oscar Van Young biography provided courtesy of �California Watercolors 1850-1970� By Gordon T. McClelland and Jay T. Last. Member: California Water Color Society. Oscar Van Young grew up in Vienna. In 1919, he received a scholarship to study art in Odessa, Russia, but after several years of instruction, fled the country because of political unrest. After traveling around Europe, he immigrated to the United States and settled in Chicago, where he continued his art education and began to exhibit his works. In 1940, Van Young moved to California to live in Los Angeles. 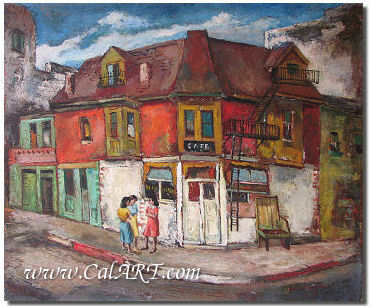 Throughout the 1940s and 1950s, he produced and exhibited watercolors depicting local Los Angeles street scenes. In addition, he was an art instructor at the Otis Art Institute and various universities. Van Young also worked as a printmaker, producing limited edition fine art lithographs, and painted large abstract oil paintings. Interview with Oscar Van Young, 1983. Original Oil Painting by Oscar Van Young. Titled "Three Blocks off Skid Row", dated 1943. Measures 30" x 35".